I hope everyone had a wonderful Christmas filled with love and good food. I know that I did. Besides the posts that had been scheduled I took a little blogging break to really enjoy the holidays and my twenty-first birthday, but it's back to work now. Can you really call it work when you love doing something? During the holidays I happen to wear more makeup than during the regular weeks. I showed you the contents of my birthday makeup bag earlier this week, but besides that I have been sticking to some other beauty items, which are taken up in this week's favorite products. First and foremost I want to mention the YSL Le Teint Touche Eclat, the foundation equivalent of the immensely popular light infusing pen that the brand has so succesfully created. I have had this foundation for quite a long time but only use it occassionally. I really don't know why because the formula and finish are amazing. Light to medium coverage with a gorgeous lit from within glow. It does have spf, so I used it sparingly so I wouldn't have that ghostly white flashback in photographs. I bought the Stila Color Me Pretty palette as a Christmas present for myself and have been enjoying it immensely since it arrived on my doorstep. Especially the Petunia shade is great to use on both lips and cheeks. The Kitten champagne gold highlighter has been my go to for that gorgeous glow during Christmas dinners. My skin has definitely cleared up over the last few weeks but to hide any leftover pesky blemishes I use the Bobbi Brown corrector in Light Bisque. I chose this over my trusty Bourjois happy light concealer because this one happens to last a little longer on my skin. Dinners, drinks and long conversations with family and loved ones don't really blend well with bold lipstick. As much as I like a good red lip, constantly having to touch up just is't practical. That's why I often chose my Clarins Instant Light Natural Lip Perfector over any brighter lip product. Pictured is number two titled Apricot Shimmer. These Clarins glosses are the only ones I will ever love. They are smooth and soft and buttery and anything but sticky. They offer a gorgeous light shade that will always compliment but never overdo a makeup look. They are the perfect lip product in my opinion. Christmas is a happy time with incredibly fun but long days. 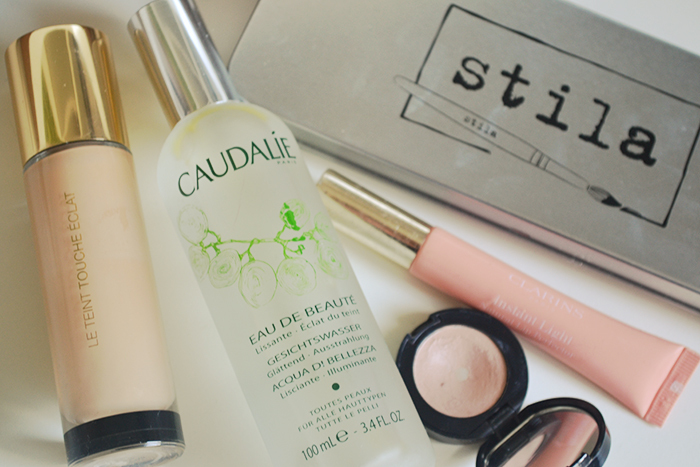 To keep my skin looking fresh and awake I have been adding a spritz of the Caudalie Beauty Elixir to my morning skin care routine. This fragrant mist is jampacked with ingredients that retain moisture in your skin and keep your complexion fresh and glowing. I know some people absolutely hate the scent, but I love how refreshing and therapeutic it is. While the Christmas rush is behind us, the world is gearing up for New Years Eve, my favorite holiday of the year. Did anyone say sparkles?